Since we've been talking dolls, here are a few more. Please meet, Jess Brown and her adorable, one of a kind rag dolls. Each doll is hand dyed in persian black teas to create variations in skin tones. They are all made of cotton muslin and linen, primarily recycled and antique fabrics and findings. 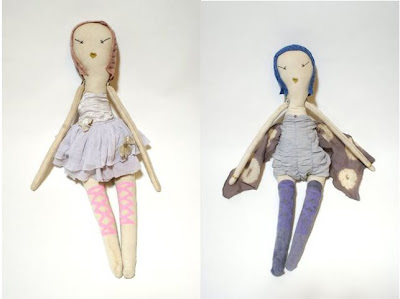 Each doll is stuffed with a sustainable corn fiber stuffing. Jess recently joined Wovenplay in a limited edition of Wovenplay dressed dolls and it worked out beautifully, since they both have a strong aesthetic connection. I find them so whimsical and intriguing, I'd love for Leah to have one of them to play and own for life.